I was lucky to have a seat at the table at Oregon’s Association of Clean Water Agencies (ACWA) conference at the end of July in Bend, Oregon. Attending the conference was an excellent opportunity for AHB Extension to get to know more about a unique grower of poplars for ecosystem services: wastewater treatment operations. The City of Prineville, Oregon constructed a wetland to filter the discharged treated wastewater while restoring the Crooked River. Click here to see a time lapse video of the project. A representative from the WateReuse Association outlined the potential benefits of recycled water and direct potable reuse of wastewater. But what does all this have to do with poplars? It’s possible that growing poplars could be the answer to some of these public utilities’ needs. Many wastewater treatment plants need better options for making use of biosolids (treated organic matter from sewage) and effluent (treated wastewater) produced by the wastewater treatment process. Some plants store the biosolids in lagoons and discharge the effluent to rivers. However, wastewater treatment plants with access to land can turn biosolids and effluent into valuable resources instead, by using them for fertilizing and irrigation. In order to gauge interest in growing poplars, I hosted a roundtable discussion called “Poplar Tree Possibilities: Clean Water, Healthy Soil, and Renewable Products” with Todd Miller (who manages a poplar biocycle farm for the Metropolitan Wastewater Management Commission in Eugene-Springfield). The roundtable discussion provided a venue where representatives from various wastewater treatment operations, engineering firms, and environmental organizations could learn more about using poplars for ecosystem systems. Importantly, it was also a venue where we could get an idea of what wastewater treatment operators would need to know in order to grow poplars as well as the concerns, obstacles, and values they see in growing them. Many of the questions raised during the discussion were well-trodden land for AHB. What are the markets? What kind of fields do you need? However, we had not thought to ask how poplar chips could be combined with biosolids to create compost, whether a public utility could sell their own poplar cuttings to others, whether the poplars would take so much water that the rivers traditionally replenished with effluent would run dry, or if the poplars couldn’t be grown too close to the airport runway for fears of attracting wildlife. Some of the participants saw potential for poplars to create an aesthetically-pleasing landscape feature in their rural community, while another city was inspired to see AHB’s Jefferson site. Another participant saw an opportunity to work together on future research. 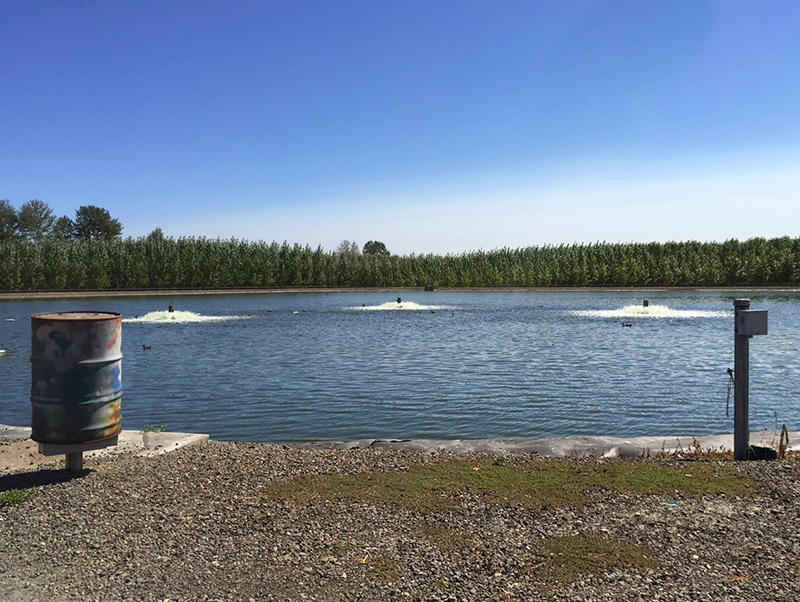 AHB Extension hopes to continue making connections with wastewater treatment professionals in the PNW, learning more about particular operations, and identifying situations where poplars might be a good option. A major theme from the speakers at the ACWA conference was that public utilities need to be able to try creative strategies—perhaps that could mean growing poplars.